Follow Me.The Last of All - Follow Me. This is a blueprint. Blueprints aren’t always followed, which is why James has to speak so strongly in his epistle, as if to hammer things back into shape: “Where do the wars and where do the conflicts among you come from?” In his assessment, the structure of the Church is misaligned when jealousy and selfish ambition are present. These evil passions arise from within us, and when they overtake us, they can overtake the Church as a whole. This has happened throughout Church history, and the Holy Spirit has inspired humble saints to keep the Church in check during these times. In our own time he has sent us the likes of Blessed Mother Theresa and Pope St. John Paul II, who willingly embraced the poor and needy, just as Jesus embraced the child in the Gospel. 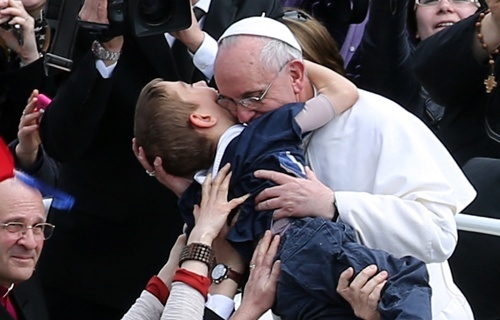 Now he has sent us Pope Francis, who commands us to go to the perepheries and make the poor the center of our faith. A fundamental question of this week’s liturgy is, “Will the Lord take care of me?” There are masses of people asking this question, not with words, but with their very being. Refugees of violence, elderly in the nursing home, neglected children, the mentally ill – all demand to know, “Will the Lord take care of me?” We can respond like Cain: “Am I my brother’s keeper?” Or we can reflect on how the Lord has taken care of us, how he has embraced us in our neediness and poverty, even when we were sinful and ungrateful. Then we can rid ourselves of our selfish passions, “that make war within our members,” and ask the Lord who he wants us to serve. This question, “Who should I serve?” is as good of a vocation question as any. It might even be better than asking, “What makes me happy?” It’s certainly more in line with Jesus’ words in the Gospel. You are made for communion. Communion begins when one person goes out of himself or herself and serves another. This is how the Trinity re-initiated communion with sinful, selfish humanity: God sent forth the Word to become incarnate and initiate a relationship with us, not first by demanding anything of us, but by serving, by washing our feet, by dying for us. Jesus never asks for anything that he doesn’t give. One of the best ways to discern your vocation is to ask, “Who is Christ calling me to serve? Where do my gifts meet the world’s needs?” This generation is a selfish, narcissistic one. But you know in the depths of your heart that you weren’t called to this. You were called by Christ to serve, to be the least of all and the servant of all. That is your vocation.